This photo shoot was the last session I scheduled before leaving the busy East Coast of the USA for the sunny shores of Orange County, and I had a blast. What's the saying, something about going out with a bang?! Mama J and I got on very well. We had a few email exchanges prior to our session. 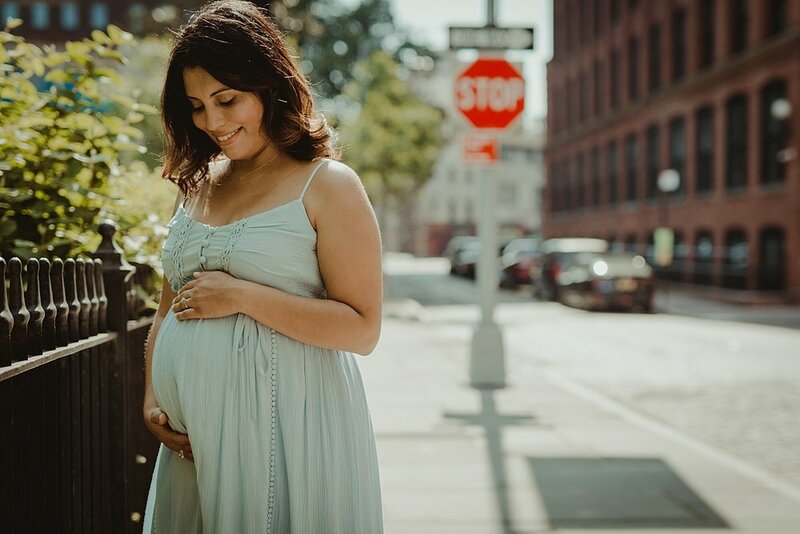 What to wear is a big decision and given they are expecting a sweet baby boy, a light blue dress seemed to fit the occasion perfectly. 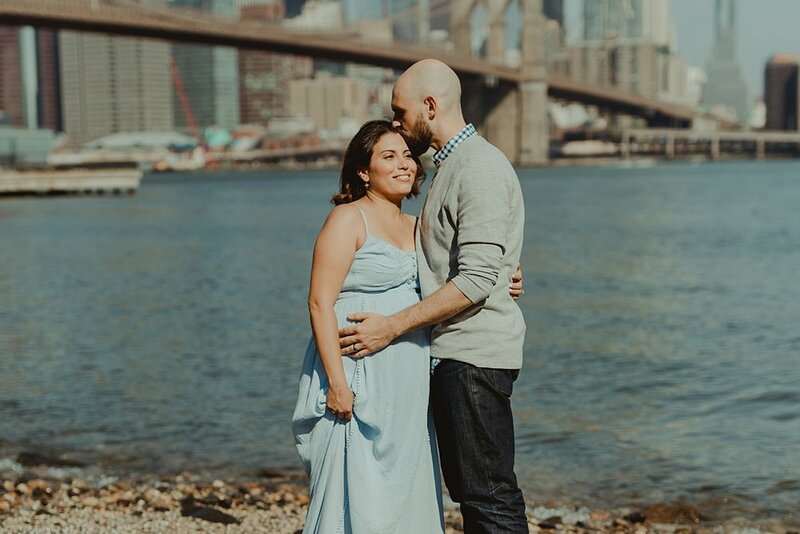 Because these two call Long Island home, they wanted to head into the big smoke for their maternity photo session. We totally lucked out with the weather as well. The weather report was initially looking dire and it was slated to rain with heaps of thunder and lightning. The thunder and lighting came but before it did, we got some gorgeous sun rays and the three of us (technically four) snuck outdoors for this session. It's pretty much a given that I adore and get on with the families I am lucky enough to shoot, but it's an added bonus when we have things in common, and this two love to travel. The conversation really started getting going when I heard about an awesome trip they'd just had in Sedona, Arizona, which included one of my favorite activities - hiking. They excitedly told me about their plans to travel to Iceland and I told them how much I loved it when we went there. But I feel like we barely scratched the surface of the vast Icelandic landscapes when we visited a little over a year ago. I think their little guy is super lucky to have parents that are going to teach him to explore the world. Travel is a gift not everyone gets to experience but it's fair to say nothing will stop this adventurous family from continuing to see the world. Scroll below to see one of my favorite maternity sessions to date and the beautiful pregnancy glow of one of the loveliest mamas-to-be! 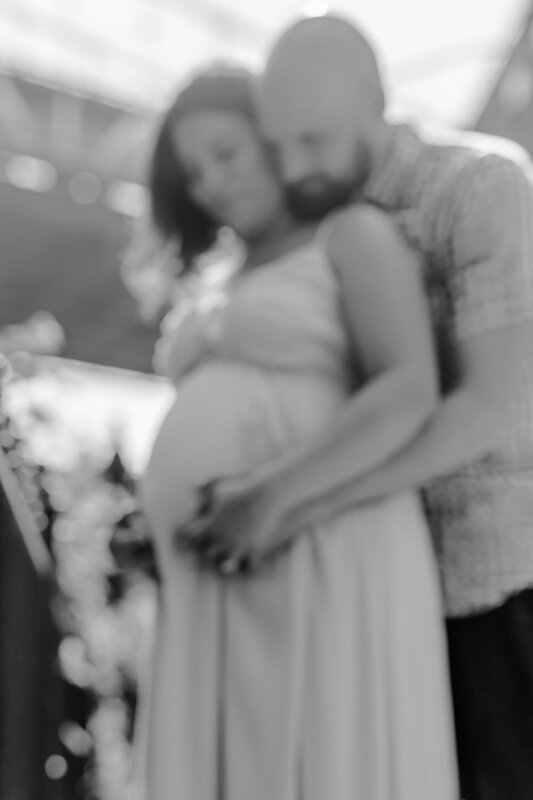 Krystil McDowall is an Orange County family photographer. If you're interested in viewing more of my work, check out my portfolio or contact me so we can discuss documenting some memories together. I also publish my images on my Instagram feed and would love for you to follow along.